A few days before I moved into my house, I stopped by to check out the paint job. 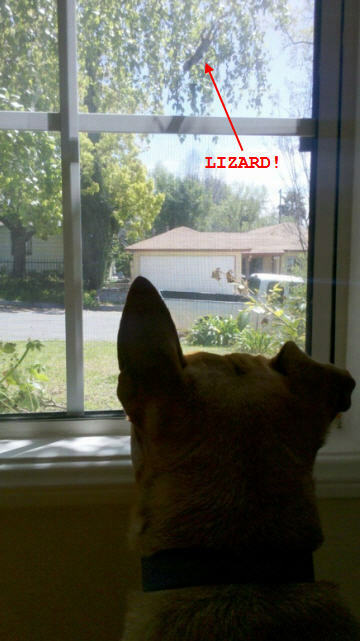 Tommy was so excited by the new neighborhood, he didn’t even notice the lizard in the window (outside, thankfully). Things changed on April 1, my first day in the house. Juanita and her two helpers were in the kitchen cleaning. I heard a scream. Juanita called out my name. Exhausted (the move was hell), I stumbled toward them. I stood outside the doorway, afraid of what I'd see. Juanita stared at me expectantly. In any crisis, a leader must emerge. I saw that lizard clinging to the wall between the microwave and the stove and squealed like a little girl. The next few minutes were filled with mayhem. We tried to coax the lizard into a bucket but it wouldn't budge. I'd opened the side door for the lizard's escape path, but Tommy charged in scaring the señoritas. When I turned away, the lizard somehow flew across the kitchen and ended up under the refrigerator. I moved the fridge. The lizard scurried across the floor into the garage. Tommy pounced on him. I screamed at Tommy as I hit him on the behind with a broom (not a proud moment, but believe me, it didn't phase him). In two seconds he had the lizard in his mouth. He shook it with abandon until half of it flew across the room into a pile of junk. The other half got sucked into his mouth as if it were a spaghetti noodle. The predator and his prey. Nature is cruel. Later, the lizard fiasco behind us, Juanita called me into the bathroom. Water seeped out from the bottom of the toilet. Two inches of dirty water filled the tub. Damn. I knew I had sewer issues but I didn't think I'd have to call a plumber my first day in the house. One had just cleaned the pipes two weeks ago. I arranged for him to come the next morning. "You can use the toilet, but don't flush." I hadn't yet returned the keys, so that night I went to my old place, leaving Tommy tied to the front tree. The electricity had already been turned off but I knew my way to the bathroom. The next morning I woke up early and drove to Starbucks to do my business. Then I went home to meet Mike the Plumber. Mike had the sewer pipes cleared in no time. What a relief. Can you imagine living without working toilets? Plumbers are unsung heroes. 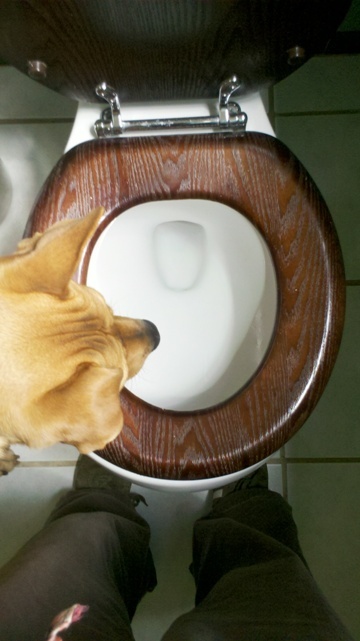 Tommy agrees as he marvels at the functioning flush.